George Catlett Marshall was nominated as Secretary of State by President Harry S. Truman on January 8, 1947, and was confirmed unanimously by the Senate. Marshall entered on duty on January 21, 1947, and served as Secretary of State until January 20, 1949. Marshall was born in Uniontown, Pennsylvania. His family had strong roots in Virginia, where Marshall returned to attend the Virginia Military Institute. Following his graduation in 1901, he received his commission as Second Lieutenant in the U.S. Army. Marshall enjoyed an extremely successful military career, serving in both World Wars and rising to the rank of five-star general in 1944. 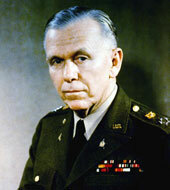 During World War II, Marshall distinguished himself as Army Chief of Staff, a position to which he was appointed by President Franklin D. Roosevelt. As Chief of Staff, Marshall earned a strong reputation as an administrator and successfully transformed a small peacetime army into a strong wartime force while also coordinating Allied operations. Marshall also proved to be adept at negotiating with Congress and other members of the executive branch, a talent that would serve him well in his civilian career. Following Marshall’s resignation as Chief of Staff, President Truman relied heavily on Marshall’s expertise to navigate postwar diplomacy. Marshall’s first assignment was to lead a special mission to China in late 1945 to mediate the conflict between the Nationalists and the Communists. Although this mission was ultimately unsuccessful, Marshall’s tenure as Secretary of State was marked by several notable achievements. In 1947 and 1948, Marshall led the effort to formulate and secure congressional support for the massive aid package to Western Europe that would become known as the Marshall Plan. The United States also negotiated the Inter-American Treaty of Reciprocal Assistance and the North Atlantic Treaty Organization under Secretary Marshall. Although Marshall typically served President Truman without objection, he did strongly disagree with Truman on the recognition of the State of Israel. Marshall resigned as Secretary of State in 1949 and became president of the American Red Cross. However, he returned to the Truman Cabinet as Secretary of Defense in 1950 and served briefly in that capacity until 1951. Marshall died in 1959 after receiving the Nobel Peace Prize in 1953 for his work to restore Europe’s economy in the post-World War II period.